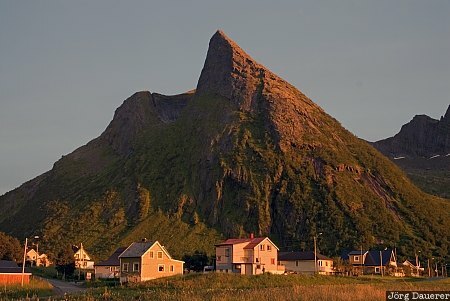 The houses of Ersfjord illuminated by the last light of the day below the steep peak of a rugged mountain on the island Senja. Senja is in the province Troms north of the arctic circle in Norway. This photo was taken in the evening of a cloudy day in August of 2010. This photo was taken with a digital camera.